Residents are assigned to a junior and senior three month rotation, their primary attachment is UTOSM sports with base hospital fly in call. The program has been developed to teach the defined body of knowledge in three month rotations at a junior and then senior level. Reference materials are kept in a shared “Dropbox” folder. “Current concepts” are used as a basis for advanced teaching. The residents know the requirements in advance. They are assessed at the end of the rotation with STACERS, MCQ, Sports specific OSCE, OSATS and a case presentation. 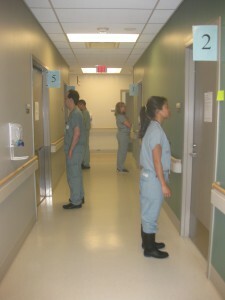 We have a bioskills program in the Simlab at WCH as part of the curriculum. A multi- disciplinary dry lab has been set up at WCH with four stations for orthopedic sports procedures. This is incorporated into the resident teaching rounds. 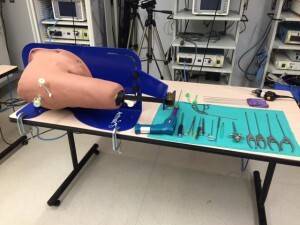 Our hip simulation laboratory is new and functional. These rounds are combined with Primary Care on the first and third Tuesdays of the month. Attendance at sports events e.g. ballet class, U of T teams. A new sports program was set up for the cadaver teaching lab. Upper and lower extremity will be done over two days each on alternate years. Upper extremity will be elbow and shoulder arthroscopy and soft tissue reconstruction.